Many ERACS technical support enquiries can be resolved in significantly less time if an ERACS support engineer can remotely connect to your computer using a Live Remote Support program. Not only does this remote connection allow a support engineer to view the problem in context, it also allows him/her to remotely control your computer in order to swiftly implement a solution. In order to establish this remote connection, a small program must be downloaded and launched. 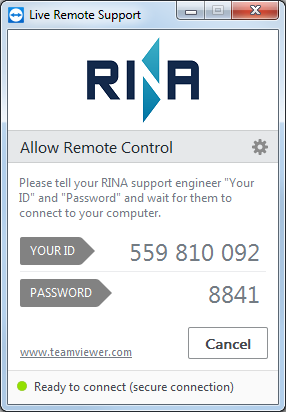 This program will display your identification number and password, which you will need to supply to the ERACS support engineer who is dealing with your enquiry. He/she will then be able to establish a connection to your computer in order to resolve your issue. After the remote session has been terminated, the program will remain on your computer, ready for a future support session to be established, until you delete it. The remote connection will employ end-to-end 256-bit session encryption which means the connection is protected from being accessed by third parties. We recommend you remain at your computer and observe the entirety of the remote session. You can reclaim control of your computer or terminate the remote session at anytime. Please close any personal or confidential information on your computer before allowing remote access to your computer, as the support engineer will be viewing your screen(s). It may not be possible to rectify some problems via the remote session. It is your responsibility to backup all applications and data prior to the remote session commencing. Launch the downloaded program (which will appear as shown in the screenshot below). Close any confidential or personal information on your computer. Call us to let us know Your ID and Password (contact details are in the menu to the left). We will then connect to your computer to resolve your ERACS issue.